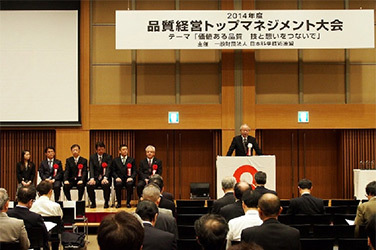 Tokyo (December 1, 2014) – Konica Minolta, Inc. (Konica Minolta) is pleased to announce that the company has been awarded the top position in the eighth Quality Management Level Research by the Union of Japanese Scientists and Engineers (JUSE). Konica Minolta’s corporate activities have been based on thoroughly customer-centric ideas and actions and pursuit of enhanced values for customers. Furthermore, the company has globally implemented systems and programs to improve quality in each process of development, production, sales and services. Not only the Konica Minolta Group companies but also their suppliers work together to run the well-thought initiatives. These activities have been commended in the research. 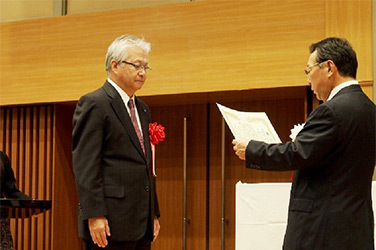 Nobuyasu Ieuji, Senior Executive Officer, receives the award at the ceremony on November 5. The Quality Management Level Research, conducted every other year, offers an independent evaluation of up-to-date quality management in Japan. Analysis is made in six factors in terms of making a quality management system and actually running the system. Scores are given in each factor and summed up for the overall ranking. This year, in its eighth assessment, 602 companies including major manufacturing, building and software sectors were invited in the survey in July and August. Konica Minolta is proud of the recognition and will continue helping enrich the quality of society through provision of high-quality products and services that enhance customer satisfaction. six factors: top management commitment; development of human resources to execute quality management; management of security, safety and trust; establishment and abidance of process; customer centricity; and capability to take good system to other parts of the company.